Stone circles were erected with a huge amount of care and hard work in prehistory, but nowadays it seems they simply pop-up. 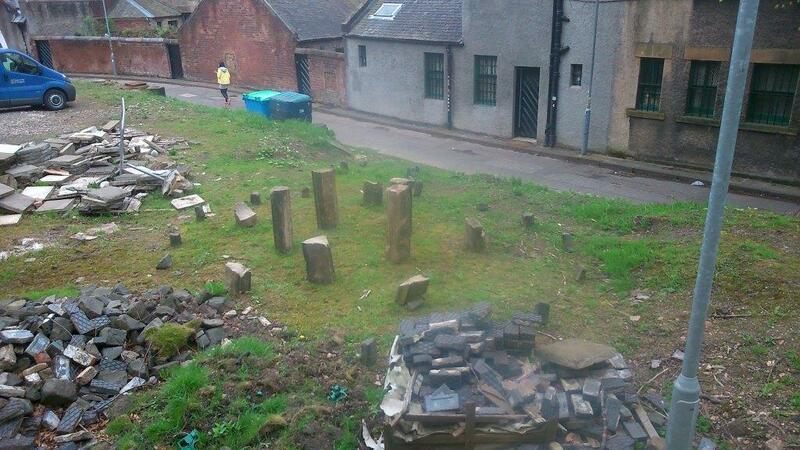 Two stone circles have popped-up around Glasgow University in the past few years, one made of foam and established for one day to celebrate the archaeology department at the University, the other an altogether more mysterious and improvised structure that has magically appeared just behind the University library at some point in the past few weeks. I wonder if these kinds of events and activities have something to tell archaeologists about new ways of engaging with the wider public? 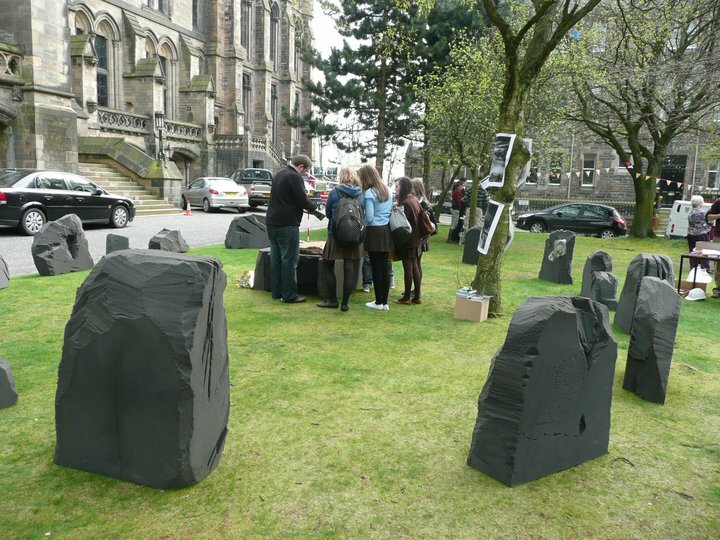 In 2011, as part of a wider campaign to publicise the work and distinctiveness of the archaeology department at Glasgow University, a Love Archaeology event was held in Professor Square to celebrate the 50th anniversary of archaeology at the University. 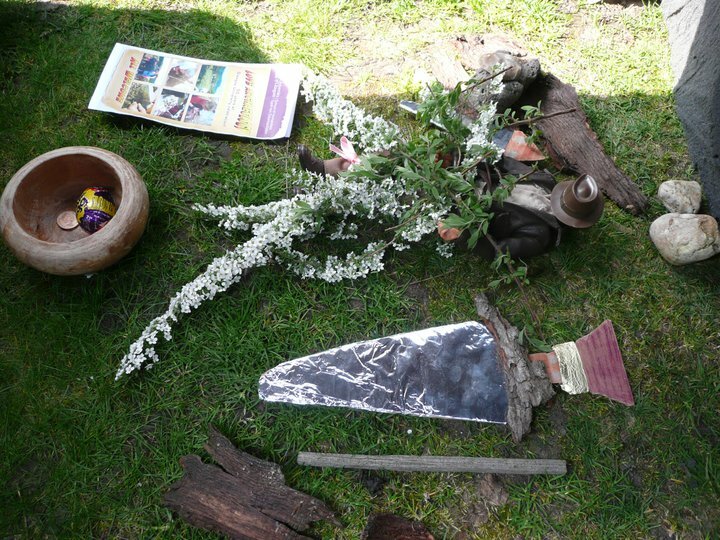 This included a mock excavation, archaeology home baking stall, pop-up Hunterian Museum zone, interactive geophysical survey, flint knapping display and a tree was adorned with images from the history and present of the department. 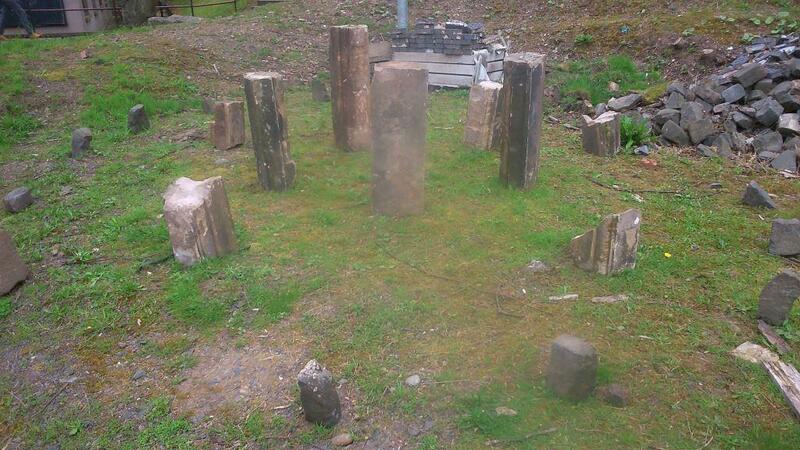 And a pop-up stone circle was constructed, a ‘foam’ version of Temple Wood stone circle, Argyll, that had been loaned from Kilmartin House Museum. The circle was laid out with a cist in the centre, which was a mocked up version of the dagger burial excavated by GU archaeologists at Forteviot, Perth and Kinross, in 2009. Ceremonies were carried out at the circle every hour or so, with shamanic craziness the theme. At the end of the day, the big foamy monoliths were lifted and loaded back into the van from which they were initially off-loaded, packed away, leaving nothing other than memories and photographs, and a lingering sense of embarrassment on the part of the shaman. 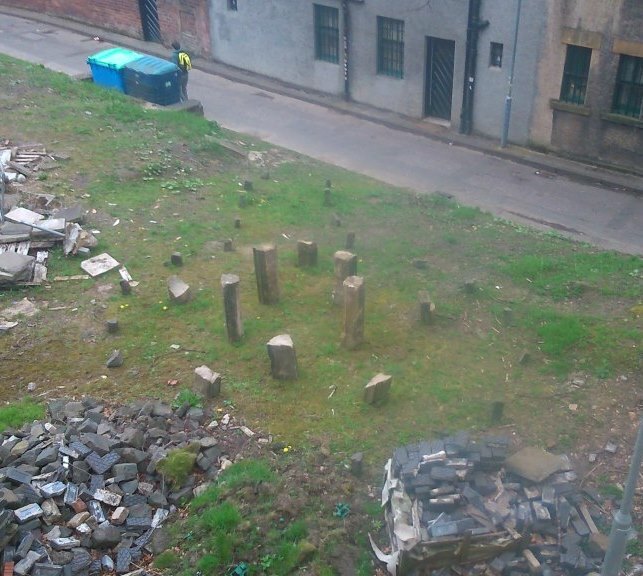 A few weeks ago, when I was walking through the campus, I noticed a bizarre and ramshackle stone circle that has appeared from nowhere. This monument is located in a quiet and rather untidy corner of the campus, beside a path that leads from the library down to the QM Union. The University has tended to use this space to park vehicles and dump rubble and building materials, and it is some of this rubble that appears to have been utilised by someone creative / drunk / with too much time on their hands. Who built this monument, and why? I have no idea. 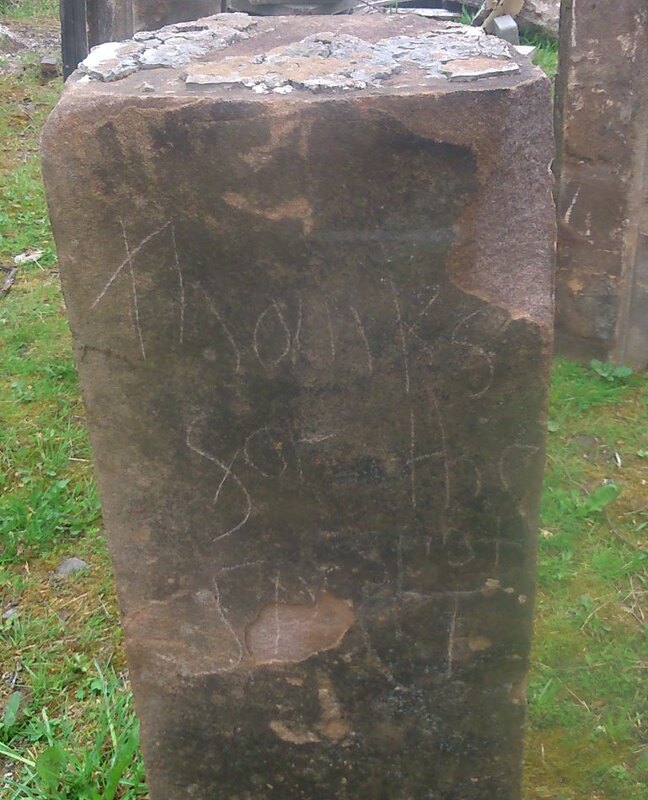 The following words scratched on the tallest central stone do not help: ‘Thanks for the [spot? sport?]’. The stones balance on the grassy surface and will probably fall over (or be pushed over) before long; it does not seem to be a structure designed for permanence. Both of these monuments have been built in the pop-up spirit. They are temporary installations which appeared almost as if from nowhere and without a fanfare. They got people talking. They have added value to the places where they popped-up. 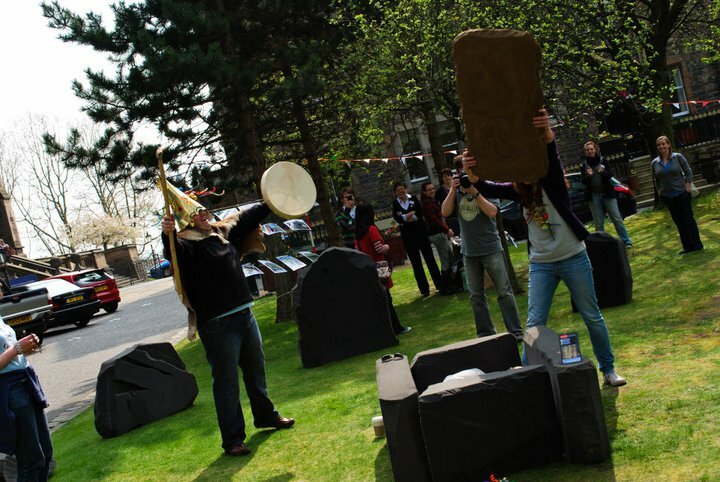 The Love Archaeology foamy circle and its central cist served an educational role, delivering a very tangible and hands-on experience of a prehistoric monument to a large volume of members of the public. The shamanic performance was intended to create memories. The complex masonry stone circle has been built in what is very much a marginal space in the campus, and this fragile looking monument has added some value and positivity to this place. The concept of a pop-up [whatever] is very much a modern concept, concerned with impact, novelty, surprise, cost-effectiveness and creating demand and interest. It is a concept that archaeologists have not yet made enough of, and yet we work with stuff that lends itself readily to the pop-up format – museum collections and artefacts, monuments, ancient crafts and activities. There is no reason why we could not run, for instance, pop-up excavations in urban places. Watch this space! Sources: the three photos of the Love Archaeology event are from their facebook page. Squaring the hypotenuse at Lagganmullan near Gatehouse of Fleet.